“The science of paleontology,” Jane A. Davidson writes, “has always been inextricably tied to art.” From the woodcuts in Konrad Gesner’s 1565 tome De rerum fossilium to the garish modern work of Luis Rey, the efforts of artists have been essential to the scientific description of fossils and bringing “lost worlds” to life. Though scientific illustration and restorations of prehistoric life may be considered outside the realm of true “art”, such efforts have a rich history. These traditions are the focus of A History of Paleontology Illustration, a slim, but nearly comprehensive, guide to paleontological imagery. Davidson begins her survey in a rather surprising place. It is rare for fossils to be featured in fine art, but in the 15th century painting A Goldsmith in His Shop, Possibly Saint Eligius by the Flemish master Petrus Christus there is, if you look carefully, a fossil shark tooth among the objects scattered on the shop’s table. The fossil plays a nearly insignificant role in the painting, but it reflects the general interpretation of such natural curiosities at the time. From this modest starting point, Davidson launches into a detailed artist-by-artist exposition of fossil illustration, explaining artistic traditions and techniques as well as the changing nature of paleontology. As would be expected, restorations of dinosaurs dominate much of the book. They captured the minds of scientists and the public in a way that could not be matched by ancient shells and fossil invertebrates. It therefore would have been easy for Davidson to focus solely on depictions of charismatic creatures in the sections dealing with the 19th century onward. To her credit, however, she goes out of her way to describe the evolving illustrations of “Labyrinthodon”/Cheriotherium, the insects depicted in Samuel Scudder’s 1890 book The Tertiary Insects of North America, and Frank Springer’s 1926 volume on echinoderms American Silurian Crinoids, among other examples. Davidson’s book provides an extensive summary, and it is probably best utilized in the same fashion as one might use an encyclopedia. Even though the chapters are coordinated around particular time periods or themes (“Fossils in Art and Book Illustration in Early Modern Europe” and “The Paleontologist Poses with Fossils”, for example), each chapter is organized as a list of artists and interesting illustrative works. Some entries are only a paragraph long and others fill up page after page, and while the book is no doubt useful as a reference it requires great attention to follow the shifts when reading from beginning-to-end. Even digital images in modern online journals, which we might expect to be technically superior, turn out to be less than satisfactory; the images in the printed editions are better. It is therefore ironic that some of the illustrations included in this book have been derived from low-quality digital images. One of which is the rarely seen Waterhouse Hawkins painting of Saint George and the Pterodactyl, a striking painting spoiled by ragged accumulations of pixels. This is a shame, and it further underlines that point that even though modern technology has made it easier than ever to capture and reproduce images, those illustrations may be no match for older forms of reproduction when it comes to quality. Despite these quibbles, Davidson has written an encompassing survey of the history of paleontological artwork. The opening chapters, in particular, do much to inform the reader about artistic concepts that regular appreciators of paleo-art might not be aware of. 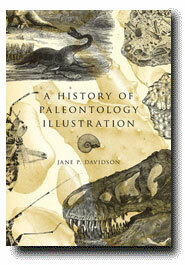 Davidson clearly drew on a wide variety of sources, from Renaissance paintings to illustrations in scientific catalogs, and her book is a unique and important contribution to the history of paleontology. Even so, there is still much work left to be done. Towards the end of the book Davidson mentions modern paleo-artists like Gregory S. Paul, Dan Varner, and Michael Trcic, but they are only given fleeting reference. An in-depth analysis of how paleo-art (and paleontology in general) changed in the wake of the “Dinosaur Renaissance” is left wanting. Given the present profusion of brightly colored, feathered dinosaurs and sauropods freed from the swampy confines of earlier illustrations, however, the time has come for a detailed analysis of the changing image of dinosaurs in the latter half of the 20th century. I can only hope that someone will read Davidson’s book and, inspired by the contents within, take up a complementary project on the rise of the modern dinosaur in art and science.